The original majuelo or 17th century vineyard of Martinsancho comprises less than two acres of ancient vines, all of which are in excess of 250 years of age. These gnarled, ungrafted vines grow out of a bed of stones over thirty feet deep, preserved in isolation as a museum of pre-phylloxera viticulture and a continuing source of undisputed varietal authenticity. Once considered an anachronism and an economic liability, nurseries throughout Europe now treasure the Martinsancho Vineyard and its beloved Verdejo for the vine cuttings it provided and the viticultural legacy it has preserved. Yet, more than forty years ago no one seemed to care about this old vineyard with its unprofitable, extremely low yielding vines; in fact, few had even heard of Martinsancho’s existence. Verdejo was on the verge of extinction as it was deemed not profitable enough then by most experts to preserve, let alone grow, despite the vine’s noble pedigree and the undisputed quality of the wine it produced. Yet, in spite of the prevailing pressure and “expert advice” to uproot the old vineyard, Angel Rodriguez preserved it, and then undertook the near impossible and what many have called sheer lunacy: he re-grafted Martinsancho’s Verdejo by hand into 25 acres of a nearby vineyard with nearly identical soil – a monolithic undertaking. 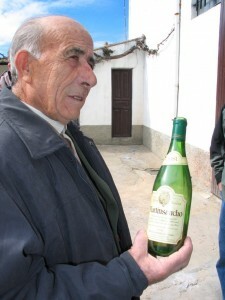 Subsequently, other Rueda growers have planted Verdejo with the help of Angel Rodriguez, to the point that today Verdejo is once again the leading white grape varietal in Rueda. For his great sacrifice and untiring efforts in favor of re-establishing Verdejo’s prominence in its region of origin, Angel Rodriguez has been officially honored by King Juan Carlos of Spain. Yet, in spite of his great accomplishment and the recognition that has followed, Angel Rodriquez remains a humble man who believes in tradition. He steadfastly maintains a very low-tech approach to the natural production of his wine, which is totally organic and includes little or no added sulfites – a rarity, especially among white wines. Look for Angel’s Rodriguez’s outstanding 2011 Martinsancho Verdejo in an upcoming feature.